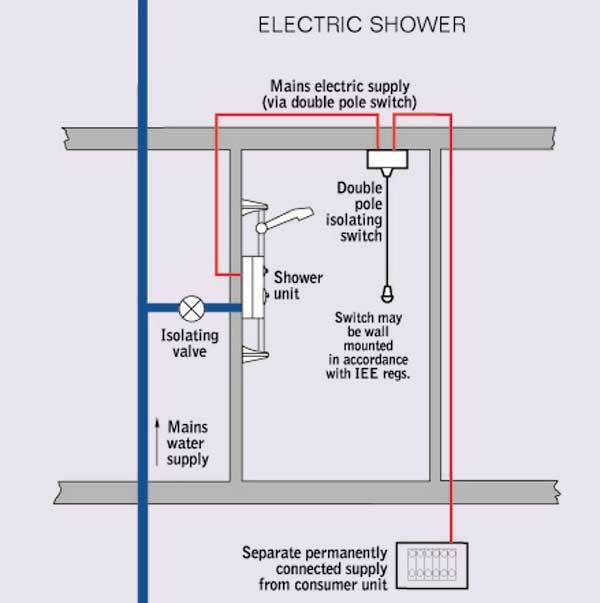 The shower must be permanently connected to the electricity supply via a double pole isolating switch with a minimum contact gap of 3mm in both poles. The switch must be readily accessible but out of reach of a person using a fixed bath or shower, except for the cord of a pull cord operated switch. The wiring must be connected to the switch without the use of a plug or socket outlet. The supply cable selected for installation must conform to the relevant table in the current I.E.E. regulations. The size of cable required is determined by the kW rating of the shower, the distance between the shower and the consumer unit and the way the cable is to be fitted. The minimum size will be 6mm2 but in some cases 10mm2 or larger will be required. For showers rated above 8kW a minimum cable size of 10mm2 is strongly recommended. To enhance electrical safety a 30mA RCD (Residual Current Device) should be installed in all UK electric and pumped shower circuits. This may be part of the consumer unit or a separate unit. IMPORTANT! If upgrading to a higher Kilowatt shower it is essential to ensure the electrical supply and shower cable is adequate for the increased load. To ensure activation of the heating elements the shower must be connected to a cold rising main water supply with a minimum running pressure of 1.0 bar (14.5 psi) at a minimum flow rate of 8 litres/minute* and a maximum static pressure of 10 bar (145 psi). Minimum running pressure of 1.5bar (22psi) required for the T80si Extra. *Minimum running pressure must be obtained at 9 litres/minute for the 9.5kW rate models and 11 litres/minute for the 10.5kW rate models. If it is intended to operate the shower under conditions other than those stated, please contact our Customer Service Department for advice. An isolation valve must be fitted in a convenient position in the supply pipe to allow the shower to be serviced. Where installation could result in the sprayhead falling below the top of the bath or shower tray, it will be necessary to fit a Double Check Valve to the inlet to prevent back flow, in accordance with water regulations and By-Laws. If in doubt please contact Triton's Customer Service Department who can supply a suitable device if necessary. 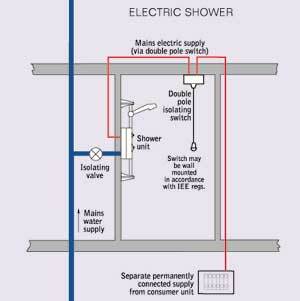 Please note: Electric showers must not be installed in steam rooms/cubicles. To reduce the effects of condensation, rooms containing a shower should be adequately ventilated. If it is intended to operate a shower in areas of hard water, a scale inhibitor may have to be fitted. The electric heating elements operate at a constant rate and the temperature of the water is varied by adjusting the flow rate using the temperature control. The greater the flow the cooler the water and vice versa. The flow rate will be greater in the summer than in the winter due to the variance in the incoming water temperature. At border line water pressures, reduction in flow rate can occur. Therefore, it may be necessary to select a lower power setting during the summer to achieve your preferred showering temperature. Showers not fitted with a power selector may not provide a full range of cool showering temperatures. Within a pressure range of 2.0 bar to 10 bar, the selected shower temperature will remain within +/-6¡C (conforms to EN60335-2-35). Should water pressure or flow fall below the specified minimum requirements the shower temperature may fluctuate. The Millennium will maintain temperature to within +1°C within a pressure range of 1.0 bar to 10 bar. During normal operation if an overheat temperature is sensed, power to the elements will be reduced. Water will continue to flow. When the temperature has cooled sufficiently, power to the elements will be automatically restored to the previous setting at the time of interruption. If, due to a blockage in the outlet of the shower, there is a build up of pressure in the heating tank, the pressure relief device (P.R.D.) will come into operation to prevent any damage to the unit. After operation the P.R.D. will need replacing. TO AVOID NUISANCE OPERATION OF THE P.R.D. AND OVERHEATING PROBLEMS ON YOUR SHOWER, THE SPRAYHEAD SHOULD BE CLEANED REGULARLY. Triton is registered by The British Standards Institute and all Triton products are designed, tested and manufactured under Quality Management Systems certified to BS EN ISO 9001 : 1994 and Environmental Management Systems approved to ISO 14001. The Triton range of mains fed electric showers are covered by a 2 year guarantee from the date of purchase (for domestic use only). The T80si Pumped, T90si, and T450i are covered by a 12 month guarantee. For a small premium this can be extended to 3 to 5 years (for full details please see the warranty application form included in every Triton shower pack). Full fitting instructions are included in every pack. If they would help you when planning your installation, a copy is available on request from the Customer Service Department. Installation should be carried out by competent tradesmen in accordance with the detailed fitting instructions supplied with every unit and in accordance with water regulations. Trade installers can phone a dedicated hotline on 024 76325491 for immediate technical advice on installation and product suitability for commercial and multiple installations.